Mark Reaney is a Professor in the Department of Theatre at the University of Kansas. He received his M.F.A. in Scenic Design from the University of Wisconsin-Madison and taught for three years at the University of Tulsa before moving to Kansas in 1987. With around 150 design credits, Mark is a winner of national and international awards for scenic design and a pioneer in the use of computer graphics in theatre design. 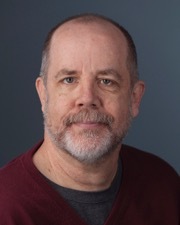 Mark is currently Director of the Institute for the Exploration of Virtual Realities, a research group actively exploring the links between real-time computer simulations and theatrical performance. Mark's original VR technology and designs for KU's 1995 production of THE ADDING MACHINE won international acclaim and the attention of both theatre and computing professionals all over the world. Since then, i.e.VR has continued it's work by developing VR tools for scenic designers, studying the possible uses of 3-D video for transmitting and recording live performance events and creating working VR scenic models for the world-wide-web. In 1996 members of i.e.VR staged a production of Arthur Kopit's WINGS for KU's University Theatre. This production broke new ground by outfitting an entire audience with virtual reality head-mounted displays. In 1998, Reaney and i.e.VR staged a production of a new script, TESLA ELECTRIC. This production introduced the use of panoramic, photo-realistic, computer generated images. The 1999 production of MACHINAL broke new ground in the combination of virtual reality and live video images. A collaboration with the University of Kent at Canterbury, England produced the exciting 2000 VR production of A MIDSUMMER NIGHT'S DREAM. And, the 2001 production of the children's theatre piece DINOSAURUS introduced the use of real-time virtual characters in the form of giant dinosaurs! Further explorative productions include: THE MAGIC FLUTE ( 2004), THE TREE OF LIFE (2010), THE ADD1N3 MACHINE-A MUSICAL (2013) and RHINOCEROS (2017). My philosophy of effective teaching of scenography is to marry theory and practice. So, a listing of courses taught would have to include all the mentor-apprentice relationships that occur in the producing of designs for UT productions. These relationships are particularly fruitful students as well as myself as I rely more heavily on student assistants to realize designs. In the Spring I taught Computer-aided design which, because of its timely subject matter, must be completely updated every time it is offered. As a UT designer I have the opportunity to "publish" my artistic work before theatre audiences.. Within the collaborative and mentoring structure of theatrical production, this form of creative work is necessarily intertwined with teaching. All told, thousands of people see my work each year. Each production is considered a major work with months of planning, pre-production work and rehearsals before the curtain rises. In addition to my traditional creative work as scenographer, I have embarked upon an additional line of research; the theoretical and practical application of computer and other electronic technologies in theatre production. As a result of this study, the ensuing publications and several fully mounted, computer-mediated stage productions; I am currently acknowledged as a leading world authority in new technologies in the theatre. I am currently reconfiguring my methods of design to conform to my physical disability. It seems that the continued experimentation in computer-aided graphics is proving valuable in this regard. I have cut down on my participation on University Committees due to the lack of consideration in using accessible meeting spaces.